Since the end of last week, we have had three amazing volunteer events! On Saturday, Jan 12th, Keep Durham Beautiful, TreesDurham, Durham Rotary, Durham Community Land Trust, Duke Energy, Leaf and Limb, as well as the City of Durham teamed up to host an event in the Southside Neighborhood.. Thanks to volunteers who came out on a cold Saturday we planted 108 trees! During the three hour event, we had about 90 volunteers come out. At the beginning of the day, we had a presentation on how to properly plant a tree, had opening remarks from Mayor Schewel, and then let the volunteers go out in small groups led by volunteer tree keepers to plant the trees in marked spaces. A big thank you everyone who came out and helped! In addition to the tree planting, we held a litter pickup that same Saturday at Mt. Holy Olive Church. Volunteers from the congregation, and from the Durham Police Department, helped to clean up the area around the church, as well as nearby Lee Street. Both groups were super excited to partner with each other on this project. Thanks to their hard work, the 30 volunteers were able to collect 18 bags of trash, 3 bags of recycling, and additional large items. About 490 lbs of trash was removed in an hour and a half! That is amazing! Congratulations to Mt. Holy Olive Church for making an impact on their community! Yesterday, Jan 15th, we held another litter cleanup this time at Long Meadow Park. Seventeen employees from EPA (Environmental Protection Agency) picked up trash from Goose Creek which runs through the park. With all ‘hands on deck’, they were able to remove 12 bags of trash and 5 bags of recycling in the span of an hour and a half! Wow! Just like Mt. Holy Olive Church, these groups are making amazing and meaningful impact on the planet. If you want to make a difference in your neighborhood, or an area of importance, through litter pick up, contact us at: info@keepdurhambeautiful.org We will be able to give you more information about opportunities and our tool lending library! Here’s to a ‘Greener’ future! Last week was very eventful! First, Keep Durham Beautiful had our monthly Board Meeting, where we elected two new board members. Welcome Austin Moore and Diane Rupprecht! Austin is a Durham native who works as a Project Manager and Co-Owner of Gateway Building Company. Austin is particularly interested in the effects of large scale multifamily recycling efforts, litter prevention from the increased commercial development and construction, and Durham neighborhood beautification projects. Diane has lived in Durham for the past twenty years, and is excited to have the opportunity to connect closer to the community. She currently works as Staff Counsel for The Sunrock Group. Diane says that this opportunity to be involved with Keep Durham Beautiful will compliment her personal interest in the environment, waste reduction, and sustainability. In addition to our successful board meeting, KDB also had our second meeting pertaining to a week-long event called Creek Week. Creek Week is a time to discover and clean up local streams. It has been celebrated by Durham since 2009. Since the beginning, there have been 1,937 volunteers who have collected 117,270 pounds of trash! It is a successful event in helping to rid trash from local creeks, as well as getting the community involved in their surrounding environment. This year, Creek Week is from March 16-23rd. Individuals can sign up for multiple events that occur during this week through our page: https://keepdurhambeautiful.org/creek-week/ We hope to see you there! Did you know that the month of March is “no straw” month? Did you know that over 500,000,000 plastic straws are used each day? That is enough to circle the earth four times! Keep Durham Beautiful is leading a campaign that encourages individuals and restaurants to considerably reduce the use of plastic straws. Plastic straws can’t be recycled, so they wind up in landfills, litter streets, wash into streams, and cause 8.5 million metric tons of plastic debris in the ocean annually. By reducing the number of plastic straws one uses on a regular basis, we can help decrease the amount of litter that ends up in nature. Instead of using plastic straws, we recommend not using a straw or buying a reusable straw made of a material of your choice; metal, silicone, paper, just to name a few. We hope that you will take this pledge during March! As of a couple of days ago, we started a partnership with Durty Bull Brewing Company. They are planning to Adopt A Street around the building, where there continually is trash. They will have one clean up every month, the “Second Sunday Clean Up.” Sign up to help through their website: http://www.durtybull.com/events/?view=calendar&month=January-2019 or through their account on Everbrite. Their first event is this Sunday from 11am-12pm. We hope you can join us this weekend or at another cleanup in the near future. HAPPY NEW YEAR TO ONE AND ALL!! Hope everyone traveled safe and ate lots of delicious food. After having the holiday season, many people are making New Year resolutions. Why not make resolutions for 2019 to help make a positive impact on the Planet? Below are some ideas that you can take with you to make less of a ‘footprint’ on the Earth. 1.) When you are going shopping try to bring your own bags. This will cut down on the number of plastic bags that are used, eventually leading to a decrease in the number found in landfills or in nature. They are reusable, and most of them are machine washable. In addition, some stores give a small discount on your total purchase if you bring your own bag. Who wouldn’t want that? 2.) Buy local food. By purchasing local food grown by farmers, you are supporting them and providing your body with a better alternative than store bought food. You won’t have to worry about health side effects from the additives in the food, and you are protecting/enhancing the ecosystem through your purchase. 3.) If you do buy from a local store, buy Fair Trade products. What are Fair Trade products? Fair Trade is a foundation whose mission is to help producers in developing countries achieve better trading conditions by promoting greater equity in international trading partnerships through dialogue, transparency, and respect. These products offer sustainable development through trading conditions and to secure the rights of marginalized producers and workers in developing countries. Buying Fair Trade products from their original producers in developing countries, at a fair price, is a more efficient way of promoting sustainable development than traditional charity and aid. 4.) Cut back on paper towels! Paper towels are convenient and cheap, but they do have a high impact on environmental littering. Paper towels are biodegradable, but there are many that take a long time to decompose due to the additional chemicals in them. If you do want to continue using paper towels, we recommend using brands that say they are made from recycled fibers or sugar cane. These break down faster plus they are biodegradable and compostable. What is better than paper towels? Using cotton dish towels to eat and pick up spills. They absorb a lot more, and they are reusable because you can wash them in the washing machine. 5.) Purchase your own water bottle to reuse, instead of using plastic bottles. Plastic bottle are one of the top materials that are the cause of environmental littering. They can pose threat to plants and wildlife. Instead of buying plastic water bottles from the store, which you only use once, reuse a BPA free bottle. 6.) Creating your own garden is a great way to become ecofriendly in the new-year. Instead of having to travel to the store, you can pick fresh vegetables and herbs from the comfort of your home. If you are to make your own garden, make sure that you plant during the right season. If you’re not interested in planting a food producing garden, you can always create a beautiful pollinator garden. This type of gardens help to reduce the impact of pesticides, they conserve water, and help to provide an overall healthy habitat for plants and animals. 7.) Wanting to use cleaning products at home that are more ‘natural?’ Below are two interesting ways that you can use everyday products to clean without the harsh chemicals. -Kitchen Stain Remover: make a past made from salt, lemon juice, and bicarbonate soda. Apply the paste to the stained around and rub in with a cloth in circular motions. This will leave a natural ‘lemon fresh’ scent in addition to removing the stain. -Toilet Bowl Cleaner: Coca-Cola might not be the best to ingest, but it can be used to clean your toilet. If you don’t have Coca-Cola, vinegar can be used too. These two mixtures have acid in them that break down rust rings as well as stains. Once you pour the product around the bowl, let it sit for an hour, scrub with your toilet bowl brush, and then flush. Done! 8.) Cut down on water time. When you are using water, whether it is for brushing your teeth or taking a shower, turn off the water when you are not using it. This saves water and doesn’t go to waste. 9.) Try not to print your receipts. If you are given the choice to have a receipt sent to you through email, take advantage of this. By emailing your receipt, you are cutting down on paper that is being used. Also, in today’s day and age, everything is electronic. So by emailing your receipt, you don’t have to worry about it getting lost. 10.) Don’t use plastic straws! Plastic straws, and utensils, are a serious problem when it comes to wildlife danger. There are different types of plastics, each with their own decompose time. The average time is about 1,000 years! If you do like using straws, instead of a plastic one, buy reusable metal ones. They are more Earth friendly and are reusable. Have things you need to get rid of after the holidays, but want to help keep the Earth clean? Welcome then come to the “easy, one stop” Drop Off event hosted by the City of Durham! The City of Durham’s Solid Waste Management Department is hosting this FREE event on Saturday, January 19 from 8 a.m. to 2 p.m. at the Durham County Memorial Stadium (home side parking lot, located at 750 Stadium Dr). This event will allow residents to dispose of E-Waste by recycling, Important Documents by shredding, and live Christmas Trees to be turned into mulch/wood chips. - This event will NOT accept large appliances, refrigerators, air conditioners or any other appliances that contain Freon in non-working condition. -Paper may contain paper clips and staples; however, hanging file folders will not be accepted. -Only paper should be brought for shredding. - All paper should be loose and not in binders or other binding items made of non-paper. - Participants with larger quantities will have items placed in boxes to be shredded off-site at Shimar Recycling’s secure facility. Durham residents who can’t attend this event can still safely and conveniently recycle their old electronics at no charge at the City’s Waste Disposal and Recycling Center (Transfer Station), located at 2115 E. Club Blvd. The facility is open Monday through Friday from 7:30 a.m. to 4 p.m. and Saturdays from 7:30 a.m. to noon. But after February 2nd, Trees will be subjected to the usual yard waste disposal fees. Yard Waste customers may receive curbside collection by placing their live trees at their curb on their scheduled collection day. Tree locations will be noted by the weekly collection crews and added to the next available Saturday collection day on January 12, January 26 or February 2. A tree collection will not count toward free brush collections for yard waste customers. Non-Yard Waste customers must contact Durham One Call at (919) 560-1200, online at https://durhamnc.gov/1439/Durham-One-Call, or via the free smartphone app in the Apple and Google Play stores to request a curbside collection of their live Christmas tree. All service requests must be received no later than the end of business on February 1. Once received, service requests will be scheduled for the next available Saturday collection on January 12, January 26 or February 2. -All decorations including tinsel, lights, garland, ornaments, nails, stands, and hardware must be removed. - Trees should not be placed in bags. Staff will be on hand to assist with unloading old electronics, paper, and live Christmas trees. Hope to see you there after the Holidays!!! The Solid Waste Management Department promotes and supports a high quality of life for the residents of Durham by providing comprehensive, responsive, environmentally-safe, efficient and cost-effective solid waste collection, recycling and disposal programs. Department services include roll-out cart collection, cart delivery and repair service, cardboard collection, yard waste collection, waste reduction and recycling, bulky item pick-up, and disposal services. The Department supports the City’s Strategic Plan by providing professional management that contributes to creating thriving, livable neighborhoods as well as an innovative and high-performing organization. As everyone knows, the Winter Holidays are right around the corner! Keep Durham Beautiful focuses on Litter Prevention, Recycling & Waste Reduction, and Community Greening. This blog will provide you some helpful tips on how You can make your holiday season, Greener. Wrapping a gift? Instead of using fancy wrapping paper, reuse newspaper as a way to wrap gifts. If you want something a little more upscale, use wrapping paper that is made from recycled material. Gift bags are also a wonderful way to “go green” this holiday season. They can be used, saved, and reused multiple times. Having a party? Use different bins for different waste material (recycling, compost, trash) so that your guests can help reduce waste going to the landfill. Traveling? If you haven’t already bought your ticket, instead of traveling long distance to celebrate, stay close to home. Treat yourself with a change of atmosphere, but save money by not having to pay for gas to travel long distance, or wait in a long line at the airport. By traveling shorter distance by car, you are helping to lower the gas emissions that are released during this holiday. Focus on experience over products. Instead of buying presents for friends and family, select a fun activity. This will make memories, and bring you closer during this time of the season. Instead of the “high tech gadget” that everyone is wanting, donate money to a charity of their choosing. This way, you spread the joy and make a difference. Need a suggestion? Sponsor a tree or make a donation to Keep Durham Beautiful. Any amount helps to better our community! Doing a lot of shopping? Bring your own reusable bag. This saves the use of plastic bags, and decreases the disposal of them in landfills. By using your own bag, you are able to fit more products into one bag. Many of these reusable bags can be found in any grocery store, or big name stores or stop by the Keep Durham Beautiful office for a free reusable tote bag. We all love food during big holidays. To reduce food waste, prepare a sensible amount of food. Save leftovers in reusable containers, and relax! Because you don’t have to cook food the next couple of days. Decorating is fun during this time. Instead of paying lots of money for decorations from the store, get creative and make your own! Conserve energy. If you have a thermostat in your house, turn it down when you are asleep or not at home. Programmable thermostats can do this for you automatically. Turn off lights in a empty rooms. Also, use incandescent light bulbs which can reduce your electricity bills by 75%. Fresh Christmas trees can end up in landfills after the holidays. Check with your local municipal solid waste provider to see if you can donate your tree to be turned into mulch/wood chips. In the City of Durham visit http://durhamnc.gov/832/Solid-Waste-Management for more information. Or, instead of buying a tree, plant a tree in remembrance of the holiday season this year. We hope these tips are helpful! Please stay safe and healthy this season. New Pollinator Books at Durham Public Libraries! Thanks to a generous grant from the Triangle Community Foundation, we were recently able to provide a donation of adult and children’s books that focus on pollinator education. The full list is provided below - inquire at your local library branch for availability! We are now over one month into 2018! Whether your resolutions are standing strong or maybe need a little help, we’re here to offer some great tips to keep trying to reduce your impact and waste. It’s important to remember that resolutions don’t have to just start in January and there is always something small you can do to preserve the earth and all it offers us. This is especially important now as, according to an article written by Laura Parker for National Geographic, “Mass production of plastics, which began just six decades ago, has accelerated so rapidly that it has created 8.3 billion metric tons—most of it in disposable products that end up as trash.” While that’s a daunting number to tackle, here are a few easy ways to reduce your plastic waste in 2018. Sometimes we create plastic waste without realizing it. Shelves in many commercial stores are stocked weekly with packs of plastic water bottles and packaging. Although these bottles can be recycled, they often end up in the trash. Buying reusable water bottles can help reduce your plastic waste imprint and can save you money. It also takes away the demand for plastic water bottle if you stop buying them which can help reduce the number of water bottles produced. While you’re switching to reusable water bottles, you might as well switch to a reusable thermos or coffee cup as well. If you start every day or even just a few days a week with coffee, think of how many disposable coffee cups that creates! Those coffee cups can’t be composted or recycled either because the inside is lined with plastic. Switching to using a reusable mug, or even deciding to take a seat and have your coffee there, will make a huge difference for the environment. In many recycling programs, plastic bags are not accepted with regular recyclables. This means recycling plastic bags may not be as accessible or convenient, leading to increased plastic waste. Instead of using plastic bags, invest in reusable bags. One benefit to this, aside from environmental benefits, is that reusable bags are sturdier; your reusable bags should not rip as easily when compared with plastic bags. If you would like to read more about which reusable bags are most sustainable, check out this article. If you forget your reusable bag, opt for paper instead of plastic because paper bags are biodegradable. The ocean is polluted by microplastics, which is the term given to very small plastic debris. Due to the Microbead-Free Waters Act of 2015 retail stores will have stopped carrying "rinse-off" microbead products starting last month. That being said, there is a loophole in this law since the act only applies to "rinse-off" products like face wash and toothpaste. Make sure to avoid all products with microbeads in them by checking out this list. Read more about microplastics and the ocean here. Some may look at the size of plastic straws and think the plastic waste is inconsequential, but they would be wrong. According to thelastplasticstraw.org, “In the U.S., we use 500 million straws a day...enough straw waste to wrap the circumference of the earth 2.5 times or to fill Yankee Stadium over 9 times in a year!” As discussed with microbeads, plastic is not biodegradable; it only breaks down into smaller plastic, which is just as harmful to the environment. A few options include not using a straw, using a biodegradable straw, or even buying a snazzy metal one! If you opt to not use a straw just take an extra second when you're ordering at a restaurant to say "No straw, please!" This is becoming more and more common to say especially with pledge campaigns like #SkiptheStraw. It’s difficult to reduce your plastic waste when everything in the store seems to be wrapped in plastic on the inside, outside, or even both! There are still ways to reduce your waste, though. Buying in bulk and bringing reusable, cloth pouches are a fantastic option. Plus, buying in bulk is typically cheaper than buying packaged items! 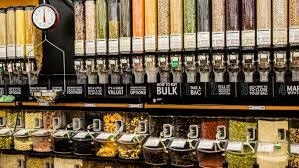 Otherwise, trying to buy things that are in boxes versus plastic bags and opting for brands that don’t have excessive packaging are all great steps to take. This includes not wrapping your produce in a plastic bag and choosing to use a reusable bag, cloth, or nothing at all instead! Starting with these small steps can make a great difference on the environmental impact we have on the earth. If you already practice these or want to eliminate your plastic waste entirely, then check out these resources like Zero Waste Week and My Plastic Free Life for more ways to reduce your plastic waste. Good luck reducing your waste and know that every little bit truly does matter! We will be working with and cheering for you. We all love the holidays, and childhood memories are tied around Christmas trees just like the ribbon that adorns them. Whether you are the family that takes your tree down right after Christmas or leaves it up long past New Year’s Day, at some point your tree will be leaving your home. The most sustainable and eco-friendly option is to recycle your beloved tree! Otherwise, it will end up in a landfill amongst non-biodegradable waste. As a result, it won’t decompose properly or allow its nutrients back into the soil. Recycling your tree will also reduce the impact of deforestation! Instead of living, growing trees being cut down for mulch, your recycled tree can be turned into mulch and wood chips instead. Natural Christmas trees may be recycled into mulch or wood chips for parks or residents, composted, or even used for creating healthier habitats for certain fish. Natural Christmas trees are better for the environment in the long-term. Many town collection services will pick up Christmas trees with regular disposal services. Check your local collection information for more on Christmas tree recycling curbside pickup because news may be released within the next few weeks. In general, trees should be stripped of all decorations and often need to be under 6 feet. If your Christmas tree is over 6 feet, check local guidelines to find out if it is acceptable for curbside pickup as is. Unfortunately, artificial Christmas trees cannot be recycled. If you are looking to get rid of an artificial tree, we suggest donating it so that it can be reused or repurposing it for as long as possible to lessen the carbon footprint created by artificial trees. Chatham County will have free Christmas tree recycling this year between December 28th and January 19th at the Main Facility, located at 28 County Services Road, Pittsboro. The Main Facility is open Monday through Friday from 7 am to 3:30 pm (closed on New Year’s Day and MLK Day). If you go before or after the free recycling timeframe, there will be a charge per weight, with a $2 minimum. “Yard Waste customers” may place their trees on their curbs between January 3 and February 2 to be collected as part of their regular service. If you are a “Non-Yard Waste customer,” then you must call Durham One Call at 919-560-1200 to request collection. Trees less than 6 feet are categorized as “yard waste” and accepted at the Landfill/Transfer Station: 5 Landfill Road, Franklinton, Franklin County, NC. The landfill is the only site that accepts yard waste (Off Timberlake Road off of Highway 56 west). *If you do not have a decal, the tree will be weighed at the landfill. Fee: $18 per ton (minimum fee of $5 usually covers the tree). The town of Cary collects Christmas trees on regular curbside yard waste collection day. Or drop-off location: Citizen's Convenience Center, 313 N. Dixon Ave.
Christmas trees are collected on the regular yard waste collection schedule. Christmas trees will be collected curbside. In Garner, there will also be a Christmas Tree Recycling Drive from 12/30/17 through 12/31/17. This drive will support Local Scouts in Troop 10. You can request your online form today at: troop10nc@gmail.com. Christmas tree pickup will be every Monday in January, starting on Tuesday, January 3rd. Waste Industries will collect your Christmas trees on your normal yard waste collection days in the month of January. Recycle your Christmas tree to mulch trails at Wake County Parks. While we all love the holidays, think about also giving to the Earth! Instead of throwing away your tree, choose to help our environment by recycling it. Happy holidays! If you celebrate Christmas, recycling your tree is the best option for the environment. Your recycled Christmas tree will likely become mulch. Trees that are still living won’t have to be cut down to produce mulch, therefore reducing the impact of deforestation. You can also use a potted tree and plant it after the holidays. This is one of the most popular tips I have seen going around. We waste a lot of paper on wrapping presents during the holiday season. If you already have gift bags from previous seasons, you can continue to reuse those for as long as possible. According to the Centers for Disease Control and Prevention, “If every American family wrapped just 3 presents in reused materials, it would save enough paper to cover 45,000 football fields.” There are many sustainable options out there for wrapping gifts. You can use something as simple and accessible as a bandana or a scarf (which is also a gift in itself) or you can buy reusable fabric gift wrap (for example, www.lilywrap.com or www.enfoldgiftwrap.com). It’s easier to use fabric gift wrap as well because it’s malleable compared to paper (which often rips)! Also, no tape needed! Carpooling and using public transportation lessens carbon emissions. It’s also more fun to shop and spend time with family and friends! Even better, consider biking. In Durham, we have a few bike sharing programs that recently began (for example, Spin and LimeBike), so check out what Durham has to offer. Shop locally at a store that prioritizes sustainability and reusing items. When shopping online, try to determine how far your packages must travel to reach you and minimize long-distance purchases as much as possible. If you do shop online, remember that cardboard boxes should be broken down so they take up minimal space (otherwise, recycling trucks may have to make multiple trips) and recycled. Additionally, when you go shopping, use reusable bags to reduce plastic waste. Let people who may buy a gift for you know that you would appreciate something environmentally friendly. Oftentimes, family and friends will ask what you would like for Christmas or what you need. If you request something that is better for the environment, you will feel better about the gift as well. It may even open a discussion about sustainable gift giving. Remember that the most personal gift you can give is your time. Following this, giving experiences, such as hiking or seeing a movie together, can be impactful gifts that do not harm the environment. Experiences are often easy to tailor to an individual’s unique interests. Another option is making donations in someone’s name to a charity or non-profit organization. If you would like to give a physical gift, consider something reusable or upcycled (such as upcycled jewelry). You can also give plants as gifts, which is beneficial for the receiver and the environment. Having lights on during the day is mostly a waste of energy. We have beautiful natural light during the day. If you want to have your lights on from dusk until dawn, you can buy a timer with a sensor on it to conserve as much energy as possible or you can set timers to be on for only a few hours at night. In addition, if you do decorate with holiday lights, try to use LED lights because they are more energy efficient. There are many tutorials online for how to compost, and composting promotes long-term sustainability. It’s a good practice to start now (when there’s often a lot of food waste) and continue throughout the year. Consider contacting your local food pantry or food bank to see if they will accept holiday leftovers. (Here’s a website to help you find local food pantries: https://www.foodpantries.org/ci/nc-durham and local food banks: http://www.feedingamerica.org/find-your-local-foodbank/.) Homeless shelters or non-profit organizations may accept leftover food as well. It is encouraged that you call ahead to ensure they accept food that is not canned or packaged. You can read more about food waste and recovery in NC here: https://localfood.ces.ncsu.edu/local-food-resource-waste-recovery/. Here’s a Thanksgiving food calculator that can be used for other holidays as well: https://www.personalcreations.com/blog/thanksgiving-food-planning-calculator. Additionally, use reusable tableware (including cloth napkins). This will cut down on plastic waste and can be reused as much as you want. You can buy ornaments from thrift stores or make your own. DIY crafts are always a fun way to get into the holiday spirit and bond with family and friends! You could also decorate a tree in your yard, but make sure you use decorations that are safe for wildlife. Research food that is safe for animals and the environment to sustainably decorate a tree in your yard. This holiday season, let’s enjoy spending time with our families, friends, and neighbors while also keeping the health of the environment in our minds and hearts. We all share the Earth as our home, so let’s make sure we show how grateful we are to be alive and give back through living in a sustainable manner. Happy Holidays! Moving into the holiday season we're excited about spending time with family and friends, getting to find exactly the right gift, and maybe even traveling to go see everyone. In the process, it is easy to forget about reducing your waste this time of year. Let's try to give a gift to Earth this year as well. In many cases, following these steps make gift giving more thoughtful, intentional, and personal. We are all so busy and I'm sure you've sent plenty of "Let's catch up some time!" texts. How about instead of catching up over coffee you can go camping, to a concert, or to your favorite city. While it's exciting to find exactly what you are looking for at the store, why not make it exactly how you want? When you give a handmade gift, you are giving not just a present, but a token of appreciation, love, and friendship through taking time to make it yourself. In many cases, this feels more special and thoughtful than a gift from the department store, no matter how perfect it is. If you reading through this, chances are you have some like-minded friends and family that are passionate about the world around them. Why not donate to their favorite charity? By donating you can both support their passion and let them know that other people think its important, too. If you want to give to Keep Durham Beautiful, just go here. 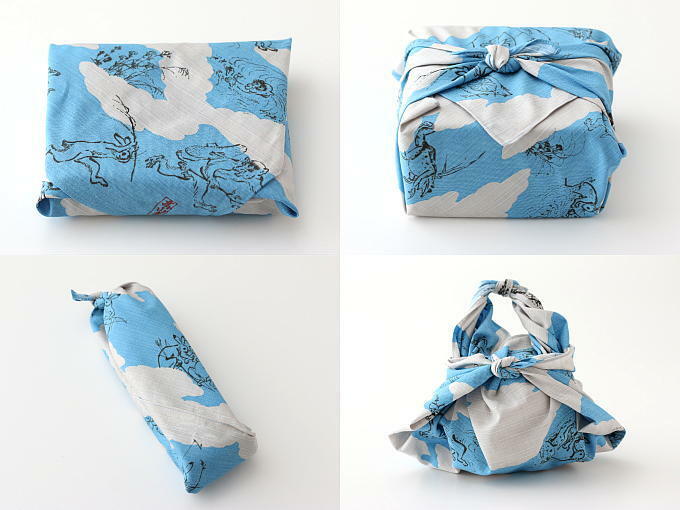 Make your wrapping part of your gift with Furoshiki. Love or hate wrapping presents, you know that A LOT of wrapping paper goes to waste this year. You put it on only to be undone and thrown away in a few minutes. This year make your wrapping paper part of the gift. Either use cloth and learn the art of Furoshiki, use newspaper and dress it up with some dried flowers, or use recycled wrapping paper. Check out some of our favorite tips and articles on giving sustainably! Happy holidays and have fun getting creative!